Our caravan site is Caravan Club approved, and is located in the quiet lanes near Perranporth, Cornwall. 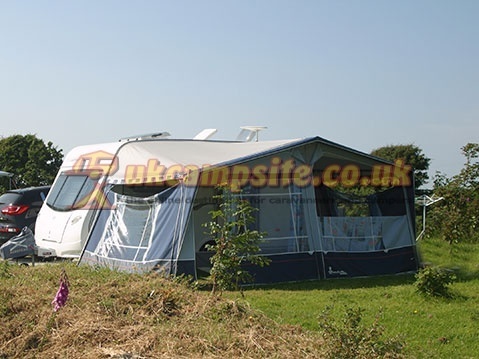 Each pitch comes with a hard standing and electric hook up and has plenty of space for the caravan awning and one vehicle. There is also a toilet/shower block as well as chemical toilet emptying facility. The site is surrounded by countryside and has wonderful views across to St Agnes Beacon and across the surrounding fields. Peace and quiet is what we offer here and we aim to make it so that there is nothing to disturb you during your stay. Set in this lovely position near the town of Perranporth, you are ideally located for visting any of the nearby beaches and towns, or to join the main road and access anywhere in Cornwall, meaning that you can tailor your holiday experience to suit your needs. With nearby Perranporth Beach which has 3km of golden sands, Crantock and Porth Joke beaches, you'll have no trouble finding somewhere to enjoy the sun and sand, or you can walk the coast path, exploring Crantock Village, Perranporth and the amazing scenic views on offer along the north Cornwall coast line. With main roads easily accessed you can get to all the main attractions like The Eden Project, Trerice Manor, Newquay's Blue Reef Aqauarium and Zoo, Creally Adventure Park or visit the more traditional Cornish villages like Padstow, Mevagissey, Fowey and St Ives where you can spend time soaking up the atmosphere of the Cornish way of life, and sample some of the local foods and gifts.